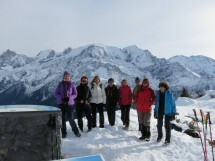 This Sunday, April 09th, I organize a snowshoe hike in Saint-Gervais. Distances from Geneva 65 km. This mountain is located between the valley of Saint-Gervais and the Chamonix. From the top, the view will be superb on the Mont Blanc and other mountains: the Aiguilles Rouges, the Aravis, Beaufortain. Orientation table before the summit (1969 m). A gradient of 830 m and a distance of 9 km. Walking time: about 5 hours.